Moose are often cute and cuddly in cartoons and books, but in real life, you wouldn’t want to mess with one. These animals are taller than your dad and they weigh more than 1,300 pounds. That’s as heavy as a car! Males have huge antlers that can grow 6 feet across or more. Moose are taller than your dad and they weigh more than 1,300 pounds. Read on to find out more all about moose. You might not like cold weather, but moose seem to prefer it. They usually live in areas with cold, snowy winters, including North America, Europe and Asia. Moose are herbivores. During the summer, they eat tall grasses and shrubs. Moose have a hard time bending all the way to the ground to eat shorter grasses. In winter, they eat woody shrubs and pinecones. Moose like to swim. They can swim many miles without stopping and can stay underwater for up to 30 seconds. 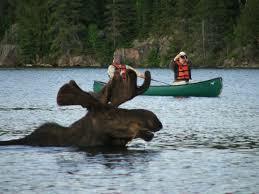 In the spring, moose look for food in rivers and lakes. They nibble on the plants growing in the water. Male moose are called bulls. They bugle, or make loud noises, in the fall to attract a mate. Moose usually have just one or two babies, known as calves. Moose can run up to 35 miles per hour. you won’t outrun a Moose. They belong to the deer family and are the largest members. Moose can be found in northern parts of the US and in most places in Canada. In Europe they have large populations in Norway, Finland, Sweden, Latvia and Poland. In Europe Moose are called “European Elk”. A moose antlers can grow up to 6 ft and can weigh as much as 65 pounds or more. Yikes you don’t want to confront an angry moose. A female moose cannot grow antlers. Male moose use their antlers for fighting and self defense, the fight is generally over a female. The front legs are longer than their back legs, this helps the moose to jump objects. Moose have excellent hearing and a fantastic sense of smell. This makes up for their relatively poor eyesight. Baby moose can run faster than you when they’re only five days old! Question: Do moose lose their antlers? Answer: Yes, the antlers fall off every year in late fall or winter. New antlers grow through the spring and summer. They are soft and velvety at first and become hard by fall. 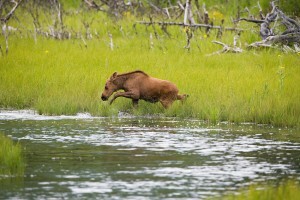 Question: Can baby moose run from predators? Answer: Predators are a danger, but baby moose can run faster than you when they’re only five days old! 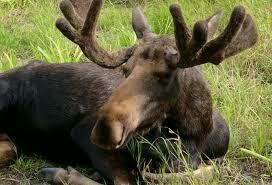 Enjoyed the Easy Science for Kids Website all about Moose info? Take the FREE & fun all about Moose quiz and download FREE Moose worksheet for kids. For lengthy info click here. Declan, Tobin. " Moose Fun Facts for Kids ." Easy Science for Kids, Apr 2019. Web. 26 Apr 2019. < https://easyscienceforkids.com/all-about-moose/ >.